UNIST and Dong Wha Pharm signed a Memorandum of Understanding, creating partnership to expand cooperation and exchange in research and drug development projects. 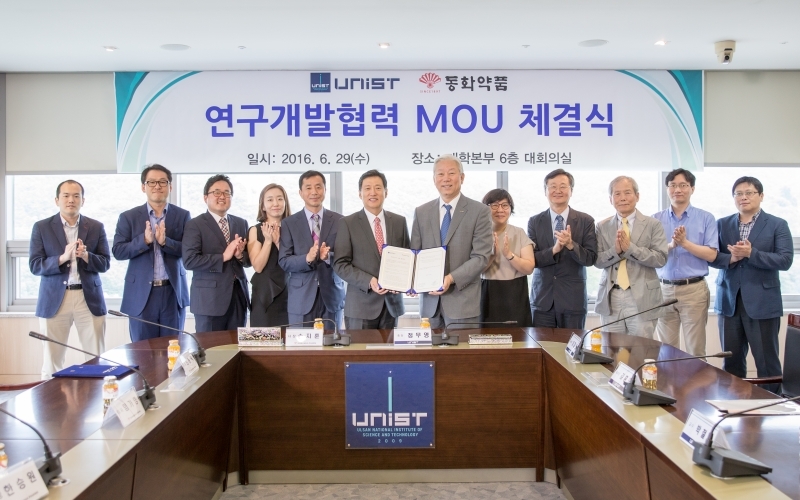 Earlier today, UNIST signed a Memorandum of Understanding (MOU) with Dong Wha Pharmaceuticals Research Institute to accelerate Alzheimer’s drug development by building a trial-ready platform for Alzheimer’s drug development. The ceremony was attended by UNIST President Mooyoung Jung, Vice President JaeSung Lee of UNIST, Dr. Hong oh Kim (Dean, UNIST School of Natural Science), Prof. Mi Hee Lim (UNIST School of Natural Science), President Sohn Ji-hoon of Dong Wha Pharm, Director GaYoung Lim (Development Planning Division, Dong Wha Pharm. Research Institute), Head Manager DongRok Choi (Dong Wha Pharm. Research Institute), and Team Leader SeungWon Han (Pharmaceutical Patent Team, Dong Wha Pharm. Research Institute). The collaboration represents a significant commitment to work together to create a high-performing, less expensive clinical trial system for Alzheimer’s and dementia. In the memorandum of understanding, the two organizations also promised to expand cooperation and exchange in research and drug development projects. 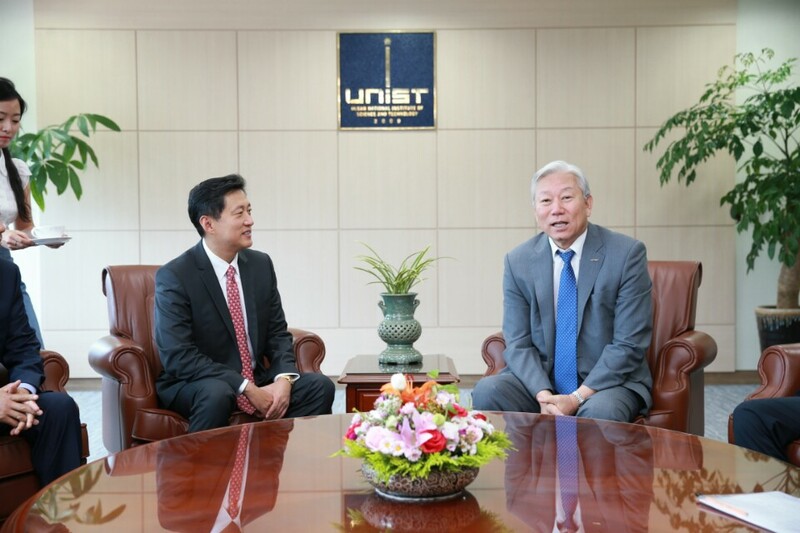 President Sohn Ji-hoon of Dong Wha Pharm (left) and UNIST President Mooyoung Jung (right) are promising to expand cooperation and exchange in research and drug development projects. President Jung notes, “This Memorandum of Understanding is the evidence for our genuine interest in working together to build trial-ready platform for Alzheimer’s drug development.” He adds, “This partnership will increase our prospects of finding important biomarkers, or discovering effective treatments for Alzheimer’s”. Founded in 1973, Dong Wha Pharmaceuticals Research Institute is the leading pharmaceutical company based in South Korea. It focuses on development of therapeutics for cancer, osteoporosis & infection and herbal drug for diabetes & cardiovascular disorders.